If you are a regular internet user, then you must have probably heard of the online outlets that actually monetize their services and pay people. 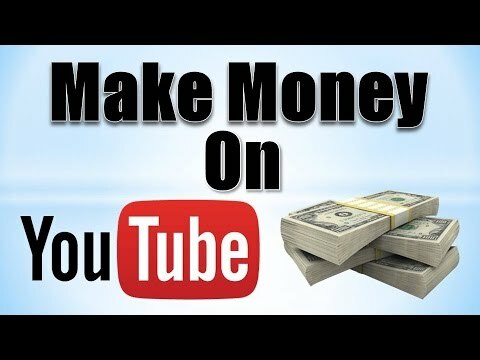 The most common on the list is Facebook, Google, YouTube, Instagram and many more on that list, but today we will be looking at HOW TO MAKE MONEY ON YouTube. Firstly, to be able to earn on YouTube, you have to create a channel where you upload your contents and where visitors would watch your videos. To create a YouTube channel: First you have to decide if it would be a personal or a business channel. If it's a personal account, try to upload a video, and then you will receive a message prompt that asks you to create a YouTube channel, it then links you to the site where you have to fill in details. If it is a public account, Go to the create account tab and click on it, then hit the Brand account button, then fill in all the details. IMPORTANT: You have to possess an email account to open a YouTube account, preferably a Google account. For more information about opening a YouTube channel, check HERE. What's a YouTube account without videos? Uploading content is the most important step if you really want to make quick cash from your YouTube channel. Just like a blog, YouTube also has to do with the amount of traffic you generate and this can be achieved by the number of visitors your content brings and the number of subscriptions you have to your channel. The higher the number, the more traffic would be generated and the faster you get close to getting that pay check. This requires a lot of patience and consistency. And to have a better edge, your posts have to be trendy and eye catching. 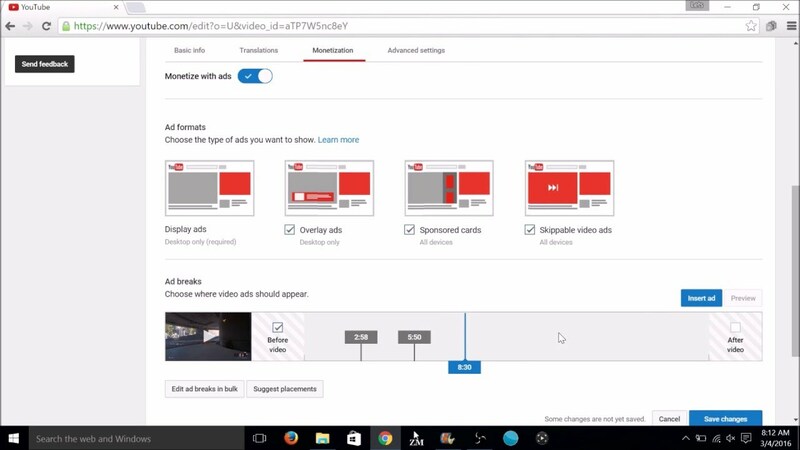 Enabling monetization of your YouTube channel means that you now give YouTube full permission to run ads on your channel on in your videos and also means that YouTube's full Terms and conditions now apply to your channel. 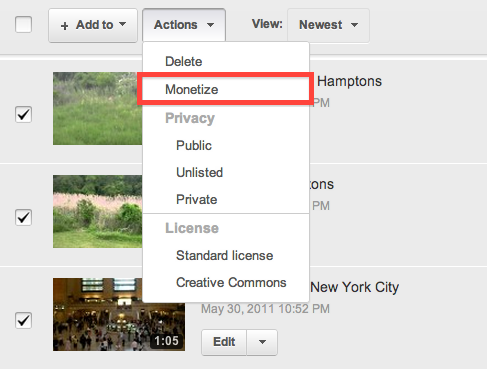 You can enable monetization by: First go to your YouTube, then click on "My Channel", click on the "Video manager"tab at the top corner, click channel and enable monetization. To make money off any uploaded video, go to your video manager and then click on the $ sign beside the particular video you plan to monetize. To actually make money off your videos, you need to have gotten at least 10,000(ten thousand) views on that video. 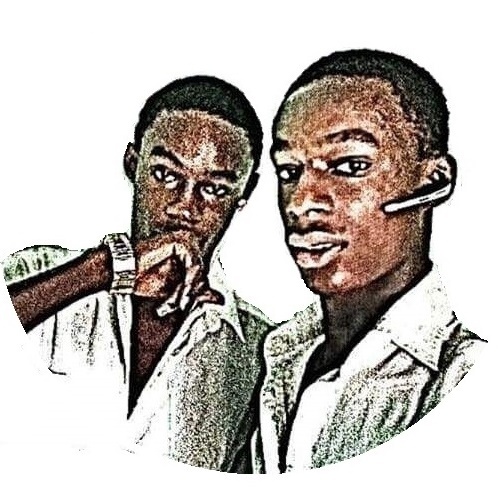 This would enable you to start earning through the Google AdSense and to enroll as a YouTube Partner. Which also has it's other benefits. Now the last part of the money making hurdle is actually setting up your Google AdSense. This can be done by going to the AdSense official website and signing up HERE. And then you'll need a valid Paypal or Bank account where Google can really verify who you are, and where to send the money to. Running ads on your videos can be really tricky. You can either use the bottom ad display, where the ad runs under your video or the before video display, where the ads run a few seconds before the main video. Whichever method you use, it is important to make sure the ads are really being viewed because that is where the pay is coming from. If the viewer skips the ads or uses an ad-blocker, those views won't count. And YouTube usually doles out pay on $7.15 PER 1000 VIDEO IMPRESSIONS. A video impression is usually measured by how much an ad is being viewed or being interacted with. If you really want to enjoy making money from your YouTube channel, then you have to really spread out your videos by sharing them on your other networks like Facebook, Twitter, Instagram and other outlets. By doing this, you are sure to get more subscribers and better traffic in your channel.